Howden honoured by Betchel as supplier of the year for work at Prairie State Energy Campus. Performance- 18000 – 22000 CMH at 250-60 MM WG. Mounting- Floor, wall bracket mounting. Application- Auxiliary mine ventilation fan are double stage axial flow fan fitted with DGMS flame proof motor. 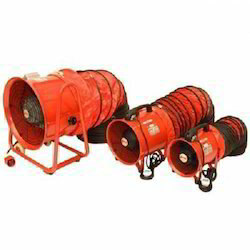 Extensively used in underground mining where inflammable and hazardous gas present in air. all these mine ventilation gases react with the environment moisture or water and produce very corrosive atmosphere which resultant corrosion in mine ventilation fan which spoil the whole profile of fan thus it reduces the mine ventilation fan efficiency drastically. The comprehensive line of ALPHAIR Cyclone custom engineered centrifugal fans from Howden are perfectly suited to applications that require moving air at higher pressures or volume, or air that is comprised of hot gases (up to 1000F/540C), corrosive gases or abrasive particulate. Wheel Diameter- 254 mm – 3000 mm. 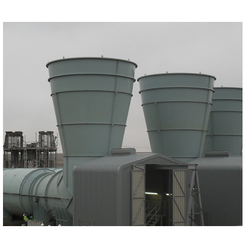 Performance- 1500 – 850000 CMH upto 150 MM WG SP in single & 300 MM WG in double stage.